Here’s a heads up for all of the Yarra Junction Festival attendees. The date for the 2011 Yarra Junction Fiddler’s Convention is now 1st to 3rd April 2011. This festival has been moved on occasion to avoid bushfire seasons and next year moves dates due to a clash with the popular Apollo Music Festival. Yarra Junction Fiddlers’ Convention is a Bluegrass and Ol’ Timey camp retreat providing musicians and festival goers an opportunity to catch up with friends, play music and enjoys dances and performances for three days. Submitted by Steve Jackson – Victoria. 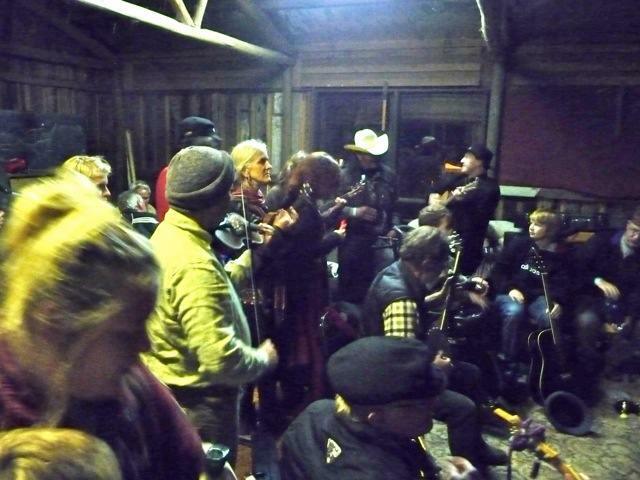 Some 450 musos and revelers descended upon Camp Eureka for a fine time of pickin’, singin’ and fiddlin’ amid delightful surroundings and surprisingly good weather. Friday night was a great time to catch up with friends and settle in to enjoy the warmth of the open fires and intoxicating music. Lots of jamming could be had during the day when not attending one of the 18 workshops available. I particularly enjoyed the flatpicking guitar with Kevin Purcell, who took us through the basics of how to make a solo to Hot Corn, Cold Corn, and through to the basics of crosspicking. John Ross covered a surprising amount of chord theory on the ukulele and the vivacious Sarah Buttillis versed us in gypsy violin. Saturday night we were entertained by Hard Drive and there were many large jams in the cosy huts and around fireplaces. The festivities peaked on Sunday afternoon with some superlative performances on the open stage. Many thanks to Ken McMaster for organising this enjoyable event. 2nd Blackwood Fiddlers’ Convention, 19th to 21 Feb 2010. The Blackwood Fiddlers’ Convention was so popular that organisers are now attempting to run two conventions in Victoria, four months apart. One in Yarra Junction and one in Blackwood. Thus the next Blackwood Fiddlers’ Convention is now scheduled for 19th to 21st February 2010 and to be held at the at the Blackwood Cricket Ground. Yarra Junction 30 April to 3rd of May 2010. Word just in from the Yarra Junction Fiddler’s Convention is that there is to be a change of date for the 2010 Convention. The dates are now Friday 30th April through to Monday 3rd May 2010. The change has become necessary to move the event away from the dangers posed by another scorching Victorian summer and the likely threat of further serious bushfires. 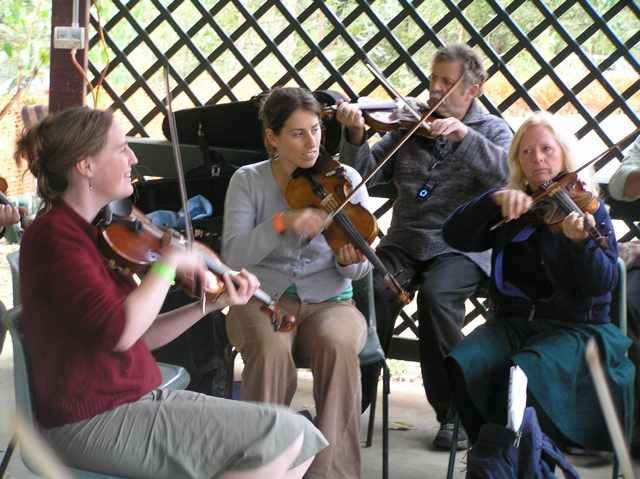 Yarra Junction Fiddlers’ Convention is a Bluegrass and Ol’ Timey camp retreat providing musicians and festival goers an opportunity to catch up with friends, play music and enjoys dances and performances. The convention is held at historic Camp Eureka which is now over 60 years old. It is the last surviving campsite in Australia used by the Eureka Communist League. The Campsite in the Yarra Ranges was originally a farmhouse of which only the barn remains. The land was given to the Eureka Communist League in 1945. More than 300 people descended upon the Blackwood Mineral Spring Caravan Park to revel at the displaced Yarra Junction Fiddler’s Convention. Some fantastic jams flourished throughout the weekend in all styles, Old-timey and Bluegrass dominating the fare. Beginners were encouraged to join in and all levels of players contributed their skills to the musical atmosphere. Workshops for fiddle, banjo, guitar and ukelele were well attended and many good tips exchanged. A wooden stage was assembled for the event and it was host to many great performers with Cajun dancing a popular attraction. One of the Blackwood caravan park regulars commented that the music was the best he had heard there in 30 years. The Fiddler’s Convention continues to be one of the best bluegrass festivals on the calendar and we thank Ken McMaster for his considerable contribution in organising this event. Proceeds for the event (about $1700) were donated to the Red Cross Victorian Bushfire Appeal. Next year the Yarra Junction Fiddlers’ Convention will return to it’s eponymously named site, but it will now be on the first weekend of May. 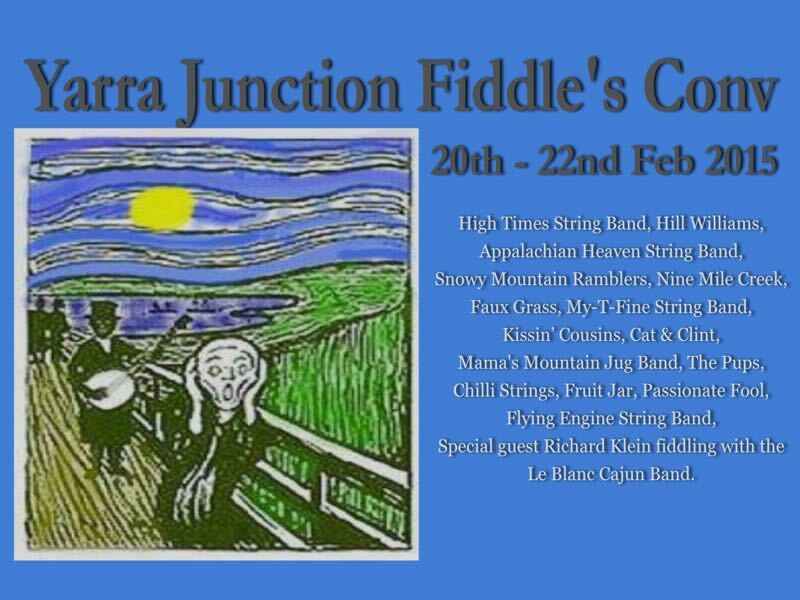 The Yarra Junction Fiddler’s Convention 20th – 23rd Feb, has been moved to an alternative location due to ongoing concerns with the Victorian Bushfires. 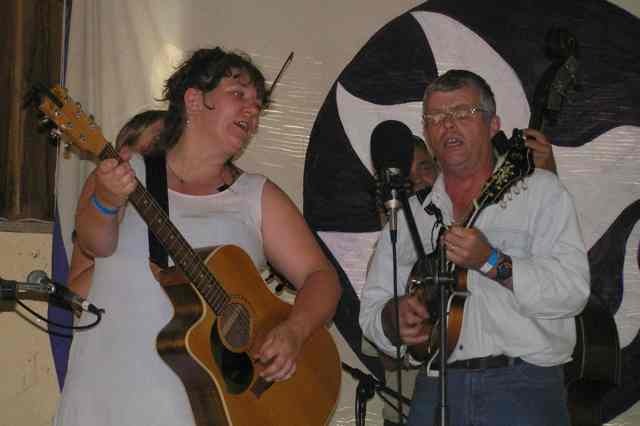 Ken McMaster advises that the 2009 Fiddlers’ Convention has been re-located to Blackwood Mineral Springs and Caravan Park site at Blackwood. Blackwood Mineral Springs and Caravan Park is approx 95km from Melbourne and powered and un-powered sites are available. Turn off the Western Hwy at the Blackwood exit, past Bacchus Marsh. The 24th Yarra Junction Fiddler’s Convention will be held at the usual venue on 20th to 23rd Feb, 2009 at Camp Eureka. Unlike many parts of rural Victoria it has been unaffected by the horrendous fires of the 8th Feb.
Ken McMaster advises that there are three CFA brigade units working in the area this week, back burning, to ensure the regions remains safe. The weather forecast from now through to the following weekend is also favourable. Come Fri 20th, head over to ‘Camp Eureka’ and find yourself a bit of cleared bush, set up camp and commence to picking. This is a rustic festival atmosphere for lovers of both music and camping. Yarra Junction Convention features old-timey, bluegrass concerts, workshops, lots of jamming and dances. 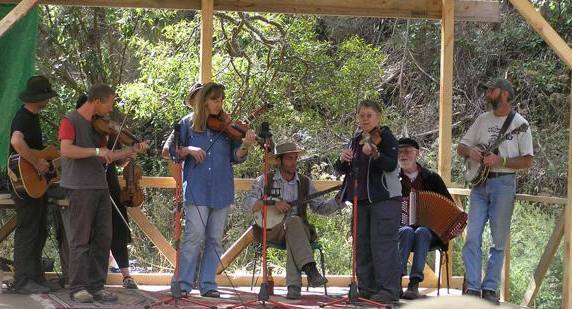 The 24th Yarra Junction Fiddlers’ Convention will be held at the usual venue, Camp Eureka, a bushland setting an hour from Melbourne Vic. Bluegrass and Ol’ Timey musicians camp for the weekend to catch up with friends, play music and enjoys dances and performances for three days from 20th to 22nd Feb 2009. ‘Camp Eurek’, now over 60 years old, is the last surviving campsite in Australia used by the Eureka Communist League. The Campsite in the Yarra Ranges was originally a farmhouse of which only the barn remains. The land was given to the Eureka Communist League in 1945.